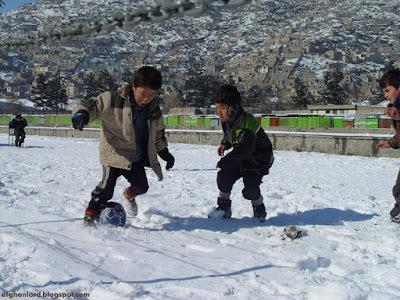 Children are playing soccer by the river of Kabul, while others are running on the streets to sell matches, cigarettes and plastic bags in order to earn money for their families. This winter, three children with their mothers died from exposure, who were lying down in front of a giant building in which the bottom contained the Cinema Pamir, a place which shows Indian Bollywood films. Not very far away are UN offices and other international NGOs who drive by in their modern luxury cars every day.